But in relation to the emergency situation in Europe the report recommended ‘that 100,000 certificates be authorized immediately for the admission into Palestine of Jews who have been the victims of Nazi and Fascist persecution, that these certificates be awarded as fast as possible in 1946 and that actual immigration be pushed forward as rapidly as conditions will permit’. According to the report, in 1940 the population of Palestine was made up of 1,068,000 Palestinians (Muslims and Christians) and 460,000 Jews, and at the end of 1946 of 1,269,000 Palestinians and 608,000 Jews. The recommendations of the Anglo-American report were immediately criticized at a conference of the Arab League in Bloudan (Syria), where they decided to implement an economic boycott against the Jews. The League pledged assistance to the Palestinians, and the conference adopted a series of secret resolutions in relation to military intervention in Palestine and the possibility of sanctions against British and American interests. These sanctions included the cessation of oil concessions in the region. 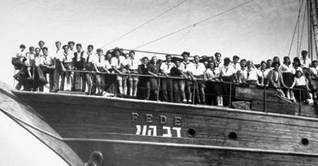 Zionist pressure in Palestine increased, as did the clandestine immigration of Jews. Zionist underground groups increasingly undertook attacks on British military targets, culminating in the bombing of the British headquarters in the King David Hotel in Jerusalem by the Irgun in July 1946, at the cost of 91 lives. Meanwhile, the British resolve to remain in Palestine faded. The war had exhausted the Empire economically and morally. It lacked the will to hold out in its colonies, where there was an incessant and violent struggle for independence. When a conference held in London in February 1947 brought no solution for the conflict in Palestine, the British government passed on the problem to the United Nations.